A first-of-its-kind fleet-wide agreement between Delta Private Jets and Gogo will soon deliver a 4G inflight experience to corporate travelers. DPJ, a wholly owned subsidiary of Delta Air Lines, plans to equip its fleet of more than 70 aircraft with Gogo Biz 4G, including services such as Gogo Vision, providing the latest movies, TV, flight tracker, weather reports, and additional features; Gogo Text & Talk, allowing passengers to call and text with their personal smart phones and mobile numbers; streaming video and audio; as well as face-to-face conversations with a user’s favorite applications; email with attachments; web browsing; and more on a proven network in the continental U.S. and large portions of Alaska and Canada. Gogo is the leading provider of inflight connectivity and wireless in-flight entertainment solutions to the global airline market. 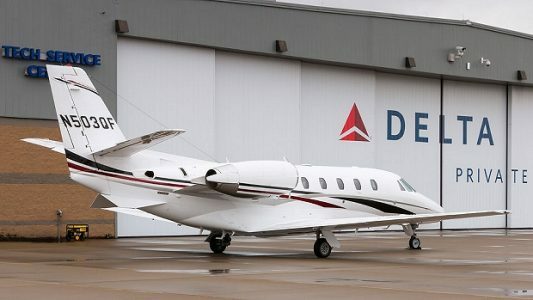 The new agreement builds upon its successful relationship serving Delta’s commercial fleet and represents the first multi-aircraft adoption of Gogo Biz 4G in the private aviation sector. Following the successful completion of the initial phases of flight testing, Gogo Biz 4G will launch in the second quarter of 2017. (Delta Air Lines).